Making Fried Tempe: Slice the tempe as desired. Put aside. Grind 1 clove garlic, 1/2 tsp koriander seeds & salt then add little bit of water. Soak the tempe in the mixture for a while then fry in a hot oil until gold brown. 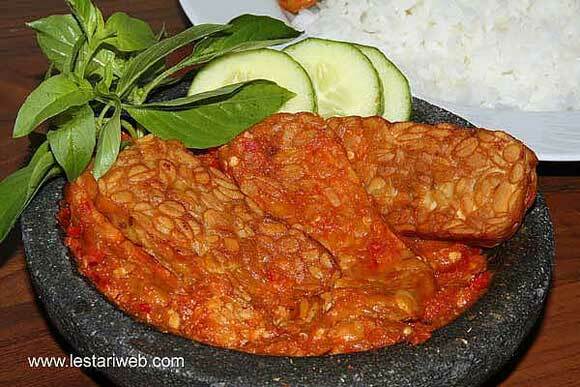 Please see Fried Tempe & Tofu for detailed recipe. Making Sambal Kencur: Fry the garlic in the used oil until light brown. 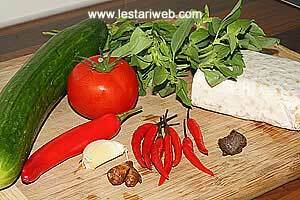 Put the chillies, garlic and lesser galangale in a mortar / grinding stone and grind until smooth. Add the chopped tomato and roasted shrimp paste , grind them again. Stir to mix. Adjust the seasoning, add the salt & sugar (if necessary). Put the fried tempe on top of the sambal kencur. Bruise / crush the tempe slightly with the pestle. Serve with rice, sliced cucumber, raw vegetables & kemangi leaves.